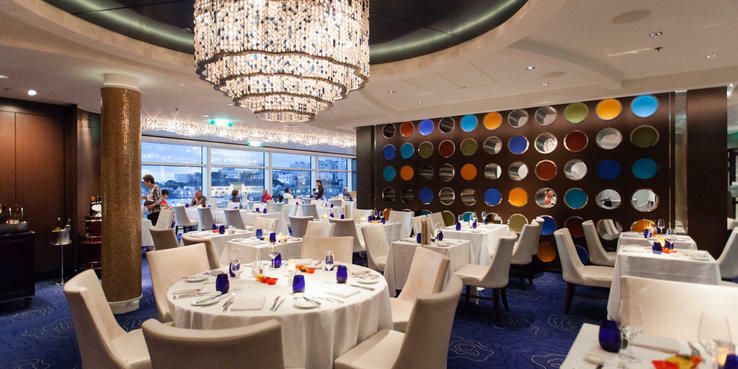 We'd venture to say that Celebrity Silhouette's dining is among the best you'll have on any mainstream ship afloat. A bold claim, perhaps, but the attention to detail, the obsession with "a la minute" (cooked to order), the sheer variety and the emphasis on fresh and unusual dishes, puts this ship a league above others -- both its sister ships in the Solstice Class and the wider mainstream cruise sector. And this is not just confined to specialty restaurants -- some of the best meals we had onboard were in Grand Cuvee, the Main Dining Room. There are many places to grab a bite to eat, including the open-all-hours Oceanview Cafe, Grand Cuvee, the Spa Cafe and the Mast Grill. Special dietary needs are well catered for, with the menus marked to denote vegetarian, vegan- and gluten-free items. The line will also prepare halal and kosher meals if you ask before sailing. Grand Cuvee (Decks 3 and 4): Silhouette's banquet hall is the Grand Cuvee Dining Room, a double-height space that features flying buttresses, a room-filling chandelier resembling an iridescent jellyfish and a shimmering glass and metal wine tower occupied by 2,500 bottles. (Cuvee means vat or tank in French wine-speak.) The lower section is reached by a sweeping staircase and the tables above look out over the sides to the main area below. Credit designer Adam Tihany, the man behind New York City's Per Se, Vegas' Seablue and the cruise ship Seabourn Ovation, with creating one of the most striking main dining rooms afloat. Breakfast is served on Deck 3 from 7:30 to 9 a.m. Classic dishes like eggs Benedict and made-to-order omelets are served for breakfast, as well as fruit, cereal, yogurt, pastries, toast, bacon and sausages, and a selection of tea and coffee. Lunch is served on sea days only on Deck 3 from noon to 1:30 p.m. The menu offers soups (including a chilled soup), salads and hot entrees. Passengers can also order items such as burgers and hot dogs from the grill. For dinner, passengers can opt for early (6 p.m.) or late (8:30 p.m.) set seating on Deck 3; or go with "Celebrity Select Dining," which offers open dining between 6 and 9:30 p.m. on the deck above. Passengers choosing the flex-dining option can pre-reserve space (online up to four days before sail date or while onboard) or walk in at any time during the allotted hours -- but be warned, you might have to wait (you get a little buzzer), at peak times. Menus consist of appetizers, soups and salads, entrees, and desserts. Note all breads (including breadsticks and specialty), pastries, desserts and pasta (on the Evening Chic night), are made fresh onboard -- and you can tell. In our view, this is among the best food you're likely to taste in a main dining room at sea. Everything is cooked fresh (or "a la minute"), so there's no food hanging around or pre-prepared and chilled for hours previously. It's also likely to be the most unusual selection of menu items you're to experience on a mainstream cruise ship -- crispy frog legs, salmon tartare or escargots a la bourguignonne anyone? More classics apps might include a (piping hot) French onion soup, chicken liver tartare and various salad variations. For the entrees, there are the "standards" such as roasted leg of lamb and beef tournedos, but for every one of those you'll find a grilled cobia (kind of like swordfish) or seared duck. The lamb was tender, tasty and a generous portion. The seared duck was outstanding, four strips, perfectly cooked with gravy rice and spinach; delicious and light. For the less adventurous, there are the "always available" items: grilled New York striploin, broiled salmon and grilled chicken breast. All the food is presented with a flourish, rather than dumped on the plate, with literal swirls and spirals on your plate. Service is exemplary -- knowledgeable, friendly and extremely helpful. Menus are marked to show gluten-free, lactose-free and vegetarian dishes. For vegetarians, there are always meat-free options like eggplant napoleon, stuffed portabella mushroom or veggie paella. Celebrity is known for its wine selection, and Silhouette boasts as many as 50,000 bottles and 300 labels -- a tiny portion of which are on display in the wine tower (the rest are in a cellar in the hold). The good news: If you have a beverage package you will be able to snag a good wine for $9, and get 20 percent off a bottle. (Tip: Ask the sommelier for a wider selection.) The heftiest weighs in at $4,000 for a Screaming Eagle from Napa Valley (the head sommelier rings the head office in Miami when one of these is sold). Passengers can bring their own wine onboard, but there's a $25-per-bottle corkage fee to drink it in the dining room -- one of the highest in cruise travel. Oceanview Cafe (Deck 14): Celebrity's buffet, featuring an excellent range of international cuisine and standards, is one of the best in big-ship cruising. It features various "action stations" positioned along the loop -- pizza, pasta and stir-fry bars, which you can customize to your taste with sauce selections (marinara, Alfredo, garlic/butter) or select meats, spices and veggie mix-ins for the stir-fries. There are also Asian dishes on offer (Chinese, Thai and Indian) and British comfort food (fish 'n' chips, shepherd's pie), as well as sandwiches and a build-a-salad bar. Breakfast includes a wide variety of cereals, yogurts, fresh fruit, pastries, toast, bacon (English, Canadian and American! ), waffles, scrambled eggs and an omelet station. There is also an Asian section with breakfast dishes such as congee, a type of porridge. Lunch features one changing "Chef's Choice" station (primarily a carving station for ham, leg of lamb, beef, etc.) in addition to tacos, pastas, stir-fry, sandwiches, soups, salads and other specialty stops. Every night is a theme night, usually reflecting the port of call. Expect an Indian theme night once a cruise when the ship is Southampton-based. It's tough to find a spot to sit near the serving area at peak times, but there are corridors on either side with plenty more seats, leading to a lovely outdoor area. The buffet is open 24 hours. Mast Grill (Deck 14): Overlooking the pool, this outlet is great for a quick snack, serving burgers, hot dogs and fries from 11:30 a.m. to 6 p.m.
Luminae (Deck 3): Although free, Luminae is open to suite passengers only. It's open for breakfast and dinner every day and lunch on sea days only, and has its own galley. Luminae has a contemporary look, with lots of light, chrome and glass; white and yellow furnishings reflect the meaning of its name (light). It's divided into two separate spaces, which give it an even more intimate feel. Menus change daily and are all freshly prepared -- often with produce sourced from the port visited that day. The menu is deliberately limited to ensure the selections are always fresh (however, you can always order from the MDR menu if there is nothing you fancy). Breakfast includes cereals, omelets and pancakes, as well as bacon and eggs and various pastries. Lunch includes a choice of three appetizers, sandwiches and entrees and two desserts. There are just two lunch menus which alternate each sea day. Dinner features four appetizers, five mains and three desserts. Meals begin with an amuse-bouche followed by the selection of appetizers. These may include a creamy truffle risotto, beef tartar and smoked trout with hearts of palm or Maine Lobster salad, Jerusalem artichoke soup and roasted squab. Mains might be buttered poached lobster, ricotta cavatelli with duck Bolognese and venison ragout or Alaskan halibut, veal loin, cote de boeuf and cauliflower steak with curried yogurt. Serving sizes are sensible to allow room for delicious desserts such as mascarpone cheesecake, coconut tapioca and chocolate mousse with cherry marshmallows, or chocolate palet or buttermilk panna cotta. Blu (Deck 5): Although free, Blu is open to AquaClass and suite passengers only. The focus here is on lighter fare (or as Celebrity calls it "clean" cuisine -- i.e., lower carbs and fewer heavy sauces). For breakfast, expect a variety of healthy starters including a yogurt parfait with granola and blueberry compote, muesli and smoothies. Hot dishes might include French toast or smoked salmon and asparagus frittata. In the evening, the focus shifts to Mediterranean cuisine and lighter fare (think ahi tuna, grilled chicken without heavy sauces), than you might find elsewhere. A quick scan of the menu reveals that the majority of the dishes are variations on those you will find in the MDR that evening, the difference however is the presentation and the service is calmer and more refined. Blu is really a place for passengers to get away from the crowds in the MDR. Open for breakfast 7:30 to 9 a.m. and dinner from 6 to 9:30 p.m.
AquaSpa Cafe (Deck 12): This is a great spot to grab breakfast if you want somewhere away from the Oceanview Cafe and are happy with a smaller selection of items. The emphasis is on healthier options, so don't expect bacon or sausages. Instead, you'll find interesting wraps such as turkey or a bruschetta with eggs; a small selection of cereals, fruits and multigrain bread and tea and coffee. You can also order fresh pressed juices ($5) or a selection of smoothies ($6). It also serves a light lunch including salad, chilled soups and pre-plated dishes of grilled chicken and fish. Room Service: Room service is available 24 hours a day with a choice of sandwiches, pizzas, salads and desserts. A free breakfast is served from 6 to 9:30 a.m. and includes fruit, pastries, toast, cereals, scrambled eggs and bacon, sausage, potatoes and hash browns as well as tea, coffee and juices. There is a charge for additional breakfast items such as omelets, steaks or smoothies. Specialty dining onboard Silhouette is also outstanding, ranging from high-end fancy French food, to excellent Italian fare to a sushi bar to a DIY grill restaurant. Each one is a pretty good value (an average of $45 per person), and worth a splurge one night on a weeklong cruise. All get booked up so make sure you make a reservation. Qsine (Deck 5); $45: There was a time when Qsine seemed the most crazy and innovative restaurant at sea -- iPad menus! Upside-down lampshades! Sushi lollipops! And to be fair, when this restaurant first appeared on Celebrity Solstice, it really was groundbreaking. Today it feels a little dated; more style than substance. That's not to say it's not still playful and fun (and if you've never been, worth going), but at $45 a person, it's a lot of money. The premise is: order on aforementioned iPads (which feel so heavy now), from icons denoting sea, land and air. Examples of dishes include a Middle Eastern sampler that comes in what looks like an Ikea shelving unit, while spring rolls are served in actual metal springs and "disco shrimp" come in a bowl with a flashing light. It's not for everyone, and some people may find it all a bit too whimsical if they're craving a "proper meal." It also lasts for hours, so be prepared to settle in for the night. Tuscan Grille (Deck 5); $45: This is a northern Italian steakhouse set in a lovely setting right at the back of the ship with gorgeous wake views (sunset here, with its floor-to-ceiling windows, is hard to beat). You enter through a "wine cave"-like archway past a table groaning with fresh produce. The grilled meats and seafood can't be beat, and pasta-lovers have plenty of options too, with ravioli, lasagna, spaghetti Bolognese and lobster linguine Alfredo all on the menu. Other signature touches are an antipasti bar and Caesar salad prepared tableside. There is also the opportunity to pay extra for upcharge items (steaks) like $15 for a bone-in New York strip. Murano (Deck 5); $50: Murano is Silhouette's high-end French restaurant, featuring traditional French dishes such as foie gras, creamy bisques and a cheese course. The main event is a six-course tasting menu, featuring an appetizer, soup, salad, fish course, sorbet, meat course and dessert; all of the dishes, except the sorbet, come from the a la carte menu and can be ordered individually for no extra charge (except the caviar) if you don't want the tasting menu. There are two choices for each course on the tasting menu, and there's an option of a wine paired with each (which raises the surcharge to $89). If you like this style of cooking then this is some of the best you'll find at sea; if you don't, we suggest you spend your money next door at Tuscan Grille. Sushi on 5 (Deck 5); a la carte: Sushi on 5 replaced Bistro on 5, which served crepes, in mid-2016. It's a welcome addition: The very reasonably priced a la carte menu offers sushi, sashimi, rolls, miso soup and noodle dishes at lunch and in the evening. It's just off a main thoroughfare and the main atrium, but never gets noisy or feels too crowded. The decor is subtle tones of red and black, with Asian touches like latticed dividers. It seats 50 people, in tables of two or four, with a sushi counter at one end. The menu offers hot and cold dishes, at reasonable prices: a bowl of miso will set you back just $3 and edamame $4. Individual nigiri (salmon, shrimp, eel) is $4 and sashimi, which comes with a choice of four is priced at $8. Hot dishes include bowls of steaming noodles ($9 to $13) with shrimp tempura and ramen dishes with lobster or pork. It's worth noting that portions are generous. Expect to pay around $50 for two without wine. Cafe al Bacio (Deck 5); a la carte: This specialty coffee shop offers lattes and cappuccinos for $4.50 and gelateria at a couple of dollars a scoop; it also serves up freshly baked cakes and cookies free of charge. Certainly one of the best located spots on the ship, it has lovely views over the atrium and out to the Promenade Deck. The Porch (Deck 15); $30: To describe this restaurant at the side of the Lawn Club Grill as "modelled on a deck in the Hamptons", as Celebrity Cruises does, is pushing it somewhat. Yes, there are lovely views to the sea and across the lawn (though these are partially blocked by the alcoves), and the tables and chairs are elegant, but the space and the food just does not live up to it. It's a raw bar and seafood venue, with a few wraps, and food-wise, it's hit and miss: gambas al pil pil (prawns in garlic), came in an almost sweet tomato sauce, rather than sizzling oil and chili; the hibachi ceviche was tasteless and the branzino (sea bass), was just that: one tiny fillet, no sides. However, the lobster bisque was delicious and the seafood platter is outstanding. The meal was redeemed by the desserts: a vanilla cheesecake served in a glass, which was delicious. Both lunch and dinner are served. The Lawn Club Grill (Deck 15); ($45): Located where the Corning Glass Show is on older Solstice Class ships, its aspect looking out across the expanse of lawn is hard to beat. It's got a limited dinner menu -- flatbreads to start, cuts of meat (mainly steak, but also lamb and chicken skewers), fish and a salad bar. That's it, but the twist is you can -- if you choose -- cook it yourself (which obviously removes any potential complaints about the cooking). Under the guidance of a very patient chef you first make your flatbread (basically a thin pizza) before choosing your topping. For the mains, you season your meat or fish before throwing it on the grill. All this in front of a curious audience. We loved it, and there's no obligation to DIY.